He is a dreamer, what can I say. He believes in breakfast. He believes that everything is better with an egg on it. I cannot entirely disagree with him. Put an egg on almost anything and you got yourself a brunch. Here is a nice little brunch that I whipped up using last week’s chard and cashew pesto! A healthy helping of wilted greens topped with pesto-covered roasted potatoes. Throw in some sun-dried tomatoes, and for goodness sake, slap an egg on it! A lovely brunch for two. Wash and cube your potatoes. Coat them in olive oil and spice them with salt, pepper and granulated garlic to taste. Lay them out on a baking pan covered in aluminum foil. Bake them for 20-25 minutes or until they are soft inside and beginning to get crispy on the outside. While your potatoes are cooking, wash and cut your chard. Heat some olive oil up in your pan over medium heat and then drop in your greens. Begin to cook down. Add in your chicken broth and continue to cook down over a medium to low heat until they are lightly wilted but still remain vibrant and green. After your potatoes are done cooking, put them into a bowl and mix in your pesto. Stir your potatoes until the pesto has completely covered them. Add in your sun died tomatoes and give them another stir. Once your potatoes are all done, you can cook your eggs. Prepare two eggs. I think this meal pairs best with over-easy eggs. 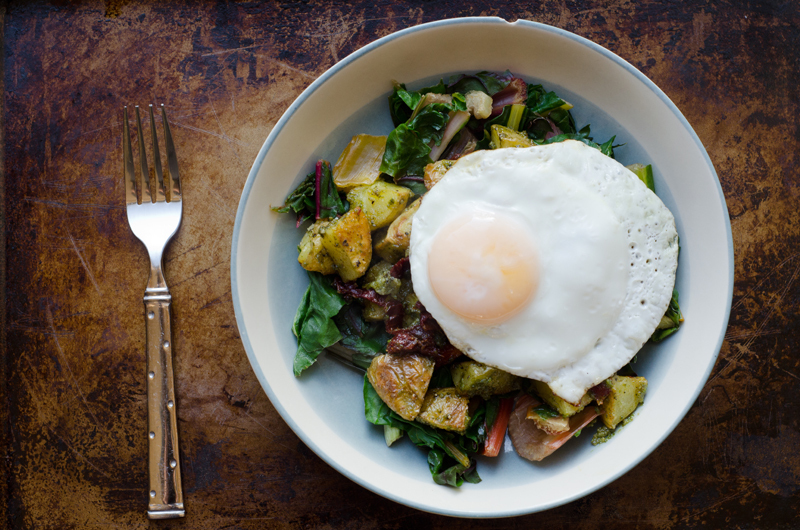 The runny yolk is a nice addition to the crispy and flavorful potatoes. Plate your meal. 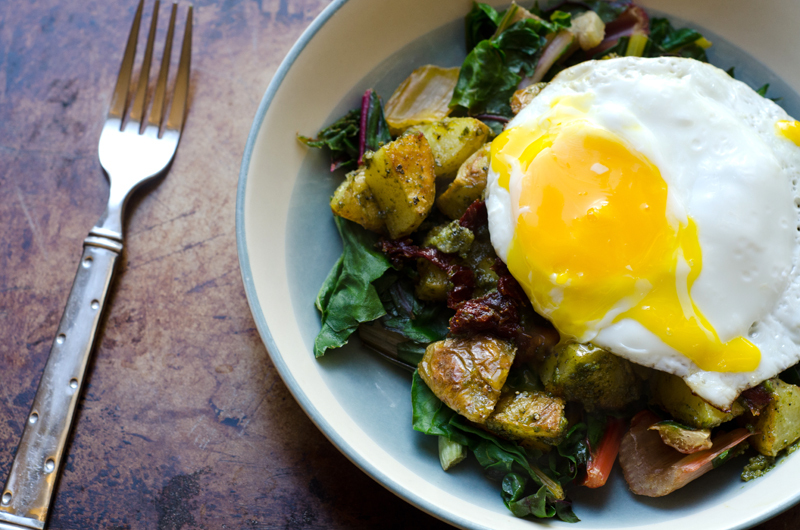 Chard, potatoes and an egg on top. Yum! Is it weird that I have been singing those lyrics to the tune of Beyoncé’s” Single Ladies” since I made this recipe? Maybe chasing my husband around the house doing the dance that she does in the video? (particularly the section where the does the whole punching and moving forwards move…) I regrettably do not have the black leotard or the fiercely baby-oiled haunches. Real life. It can be awkward.